The domain within your query sequence starts at position 124 and ends at position 195; the E-value for the SpoU_sub_bind domain shown below is 1.99e-5. 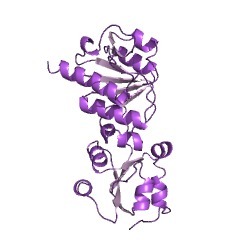 This domain is a RNA 2'-O ribose methyltransferase substrate binding domain. Most cellular RNAs undergo a number of post-transcriptional nucleoside modifications. While the biological role of many of these modifications is unknown, some have been shown to be necessary for cell growth or for resistance to antibiotics [(PUBMED:8266080), (PUBMED:9187657)]. One of the most common modifications is 2'O-ribose methylation catalysed by the RNA 2'O-ribose methyltransferases, a large enzyme family that transfer a methyl group from S-adenosyl-L-methionine (AdoMet) to the 2'-OH group of the backbone ribose [(PUBMED:9917067)]. 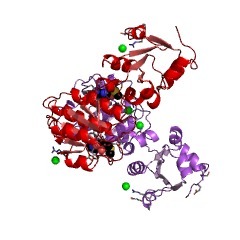 This entry represents a substrate-binding domain found in a variety of bacterial and mitochondrial RNA 2'-O ribose methyltransferases. These include the bacterial enzyme RlmB, which specifically methylates the conserved nucleotide guanosine 2251 in 23S RNA, and PET56, which specifically methylates the equivalent guanosine in mitochondrial 21S RNA [(PUBMED:11698387), (PUBMED:8266080)]. This domain forms a four-stranded mixed beta sheet similar to that found in other RNA binding enzymes [(PUBMED:12377117)]. It shows considerable conformational flexibility which is thought to be important for its ability to bind RNA. There are 29726 SpoU_sub_bind domains in 29725 proteins in SMART's nrdb database. Taxonomic distribution of proteins containing SpoU_sub_bind domain. This tree includes only several representative species. The complete taxonomic breakdown of all proteins with SpoU_sub_bind domain is also avaliable. Click on the protein counts, or double click on taxonomic names to display all proteins containing SpoU_sub_bind domain in the selected taxonomic class. The yeast Saccharomyces cerevisiae YDL112w ORF encodes the putative2'-O-ribose methyltransferase catalyzing the formation of Gm18 in tRNAs. The protein sequences of three known RNA 2'-O-ribose methylases were usedas probes for detecting putative homologs through iterative searches ofgenomic databases. We have identified 45 new positive Open Reading Frames(ORFs), mostly in prokaryotic genomes. Five complete eukaryotic ORFs werealso detected, among which was a single ORF (YDL112w) in the yeastSaccharomyces cerevisiae genome. After genetic depletion of YDL112w, weobserved a specific defect in tRNA ribose methylation, with the completedisappearance of Gm18 in all tRNAs that naturally contain thismodification, whereas other tRNA ribose methylations and the complexpattern of rRNA ribose methylations were not affected. The tRNA G18methylation defect was suppressed by transformation of the disruptedstrain with a plasmid allowing expression of YDL112wp. The formation ofGm18 on an in vitro transcript of a yeast tRNASer naturally containingthis methylation, which was efficiently catalyzed by cell-free extractsfrom the wild-type yeast strain, did not occur with extracts from thedisrupted strain. The protein encoded by the YDL112w ORF, termed Trm3(tRNA methylation), is therefore likely to be the tRNA (Gm18) ribosemethylase. In in vitro assays, its activity is strongly dependent on tRNAarchitecture. 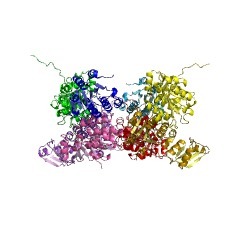 Trm3p, the first putative tRNA ribose methylase identifiedin an eukaryotic organism, is considerably larger than its Escherichiacoli functional homolog spoU (1,436 amino acids vs. 229 amino acids), orany known or putative prokaryotic RNA ribose methyltransferase. Homologsfound in human (TRP-185 protein), Caenorhabditis elegans and Arabidopsisthaliana also exhibit a very long N-terminal extension not related to anyprotein sequence in databases. Solution structure of an rRNA methyltransferase (ErmAM) that confersmacrolide-lincosamide-streptogramin antibiotic resistance. The Erm family of methyltransferases is responsible for the development ofresistance to the macrolide-lincosamide-streptogramin type B (MLS)antibiotics. 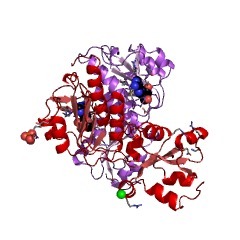 These enzymes methylate an adenine of 23S ribosomal RNA thatprevents the MLS antibiotics from binding to the ribosome and exhibitingtheir antibacterial activity. Here we describe the three-dimensionalstructure of an Erm family member, ErmAM, as determined by NMRspectroscopy. The catalytic domain of ErmAM is structurally similar tothat found in other methyltransferases and consists of a seven-strandedbeta-sheet flanked by alpha-helices and a small two-stranded beta-sheet.In contrast to the catalytic domain, the substrate binding domain isdifferent from other methyltransferases and adopts a novel fold thatconsists of four alpha-helices. Functional requirement of a site-specific ribose methylation in ribosomalRNA. The product of the PET56 nuclear gene of Saccharomyces cerevisiae wasshown to be required for ribose methylation at a universally conservednucleotide in the peptidyl transferase center of the mitochondrial largeribosomal RNA (21S rRNA). Cells reduced in this activity were deficient information of functional large subunits of the mitochondrial ribosome. Thepurified Pet56 protein catalyzed the site-specific formation of2'-O-methylguanosine on in vitro transcripts of both mitochondrial 21SrRNA and Escherichia coli 23S rRNA. These results provide evidence for anessential modified nucleotide in rRNA.